◎ Xi’s rivals could use Cai’s misstep to stoke social tensions further and worsen the situation. Recently, the Beijing municipal authorities halted three controversial projects—mass evictions of migrant workers, tearing down of signboards, and banning the burning of coal for heating. All three campaigns were carried out at the behest of Beijing municipal Party secretary Cai Qi. Why it matters: Cai may be an official whom Xi trusts, but his policies run counter to Xi’s call to “improve the people’s livelihood” in his 19th Congress work report. Xi’s political rivals have since targeted Cai for attack and criticism. The backdrop: Cai Qi and Xi Jinping were former colleagues in the provinces of Fujian and Zhejiang. Xi later appointed Cai as deputy director of the National Security Commission Office after the security apparatus oversight body was established in 2013. Three years later, Cai became Beijing mayor, and he was again promoted to Beijing municipal Party secretary before the 19th Party Congress. Cai Qi is one of several nonelite officials (not a Central Committee member or alternate member) to be elevated to the Politburo. 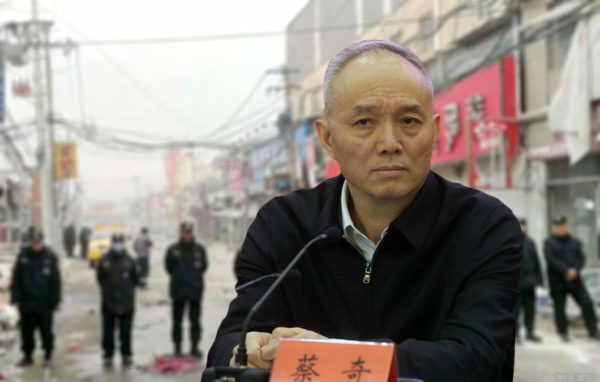 Foreign media outlets and state media like People’s Daily, Global Times, and China Youth Daily fiercely criticized Cai’s three controversial campaigns. Meanwhile, overseas Chinese news sites carried a picture of Xi’s rival Jiang Zemin receiving guests at home on Dec. 11. On the same day, the Supreme People’s Procuratorate began formal legal proceedings against disgraced Politburo member and Chongqing chief Sun Zhengcai for accepting bribes, abusing power, and leaking state secrets. 1. We believe that Cai Qi has stepped on a landmine in his haste to build up political capital by resorting to the Chinese Communist Party’s usual heavy-handed governance methods. Xi’s rivals could use Cai’s misstep to stoke social tensions further and worsen the situation. 2. State media’s criticism of Cai is noteworthy since the propaganda apparatus is now in the hands of Xi’s allies Wang Huning and Huang Kunming. Wang and Huang replaced Jiang faction members Liu Yunshan and Liu Qibao at the 19th Party Congress reshuffle. 3. Because Cai is already Politburo member, his career wouldn’t be too greatly affected by his controversial policies, unless things take a turn for the worse. Instead, lower-ranking officials in the Beijing municipal government could be made scapegoats.